Hi y'all! Hope everyone's having a great weekend! It has been H-O-T!!! And watching 6, yes, 6 baseball games in the heat can really wear ya out!!! Don't worry, they were split up - our oldest played 2 on Friday, our middle one played 2 on Saturday and they each had one today. Yep, I'm ready for a nap, hehe! I made this card for the Verve new release challenge. What's sweet is that I actually WON a gift certificate for Verve!!!! Yippee!!! Any suggestions on a set or two or three??!! They're all sooo pretty, I'm having a hard time deciding. Anyway, I also used this week's color combo challenge ~ amethyst, apricot and suede. I made a set of 5 cards using these colors because 1. amethyst and apricot are soon-to-be retired colors from SU, so I might as well use it up and 2. now I have a sweet little set of cards as a teachers' gift for next year! Nope, I don't normally plan this for ahead, but I'm come to realize that I NEED to start!!! Pretty simple card, but love how it turned out. 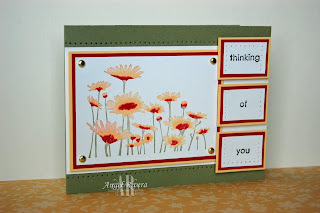 I really like the texture behind the sentiment layer. Hi again! Here's a card I made using this weeks' sketch challenge. I decided to use the same color combo as the last card since I hardly use mellow moss anymore. I love this Upsy Daisy set! I used my SU markers to color the image. The sentiment is from Trendy Trees but I broke it up to suit the sketch. Lots of piercing and some brads finish it up. Yes, people, I stamped AGAIN! Still busy, even though it's summer time, with baseball and the boys MAKING me take them to the pool, hehe! We've also been working on getting the house organized and prepping for a yard sale. So, what are the challenges you ask??? Well, first is this weeks' CAS (Clean and Simple) challenge on SCS to use something that flies on your card. This is the first time I've used my SU bird punch and yes, it's too cool! Second is this weeks' color challenge on SCS ~ barely banana, mellow moss and real red. I barely (ha!) have any banana cardstock left and was more than happy to use up some moss that's been sitting for ages. I bought this new embossing folder a few weeks ago and, of course, am just now getting around to using it. Love the cool, modern feel to it. The third challenge is Mercy's sketch challenge (link to her blog is on the right). So, yes, basically, I didn't have to do too much thinking on this card, but I'm trying to find my groove again and it helps me if I do some challenges till I find my flow, kwim??? 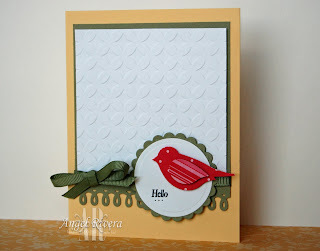 The only stamping is the little "hello" which is from a Flourishes set. As always, thanks for stopping by!!!! Summer time, summer time, yay for summer time! Yes, school's out and I'm thrilled to have some stamping time again!!!! I don't remember the last time mojo and I sat down together, so I thought I'd start up with a couple of challenges to get the ol' juices flowing. 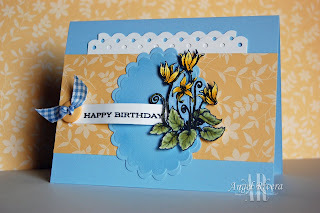 This card uses the sketch challenge on Splitcoast for this week and also the Flourishes blog challenge, which you can check out HERE: http://www.flourishes.org/2010/06/sunshine-blue-skies-challenge/. The flowers are cut out and are up on dimensionals. I broke out some old SU dp (ok, so not that old, but still...) and used a border punch for the white strips. The scalloped oval was done using Spellbinders nesties and I also sponged around the embossed area for depth. I did the "wave" affect for the sentiment and finished it off w/ a button and some gingham I've had forever. My goal is to use what I have, well, now, except for stamp sets ~~ always need more of those *wink*! I just have so much paper and schtuff, know what I mean?!!! Thanks for stopping by!!!! Guess who's a Guest designer for Hanna Stamps?!!! The Card Concept Challenge Time! 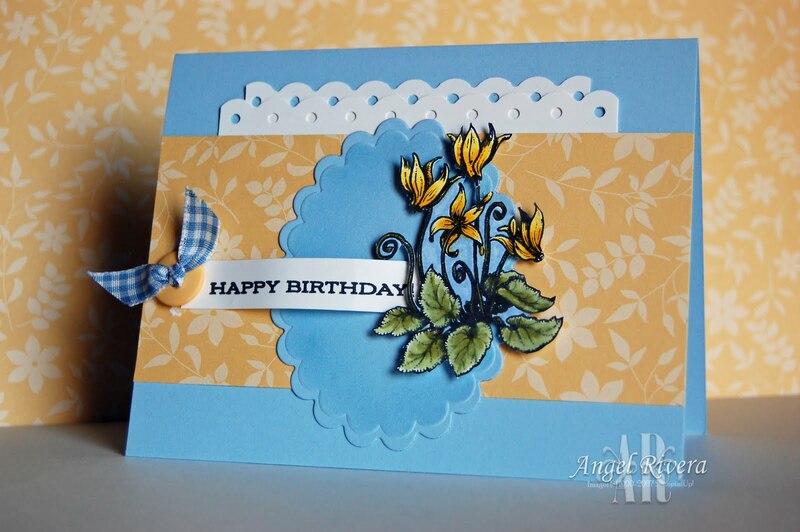 MFT Card Design Superstar Contest! YNS Feature Day - Spring! ALL cards are for sale! Just leave a comment with your email and I'll be in touch! All content including text, pictures and designs are copyright Angel Rivera. My artwork is shared for personal inspiration only and may not be copied for publication or contest entry.